If you like a traditional style, cut-on-contact, 2-blade broadhead, I don't think you will find any better than the Simmons Sharks models. I've shot a bunch of different 2-blade cut-to-tip heads, and several animals with some of them and I think the Simmons Sharks 2-blade heads are the best ones on the market. That being said, I am not a real big fan of 2-blade heads - I'd rather shoot a 3-blade or 4-blade head. In my experience, 2-blade heads just do not produce the blood trails that a 3 or 4 blade head does. They just cut more of a "slit" rather than a "hole". Simmons does have optional bleeder blades for all of their heads, but I wouldn't recommend them. They are a real thin, spring-steel and are made to break and shear off when hitting heavy bone. My personal opinion is that the Simmons Sharks are much better as 2-blade heads than they are as 4-blades. The design on the Sharks is a strongly concave one and at first glance one might think the design would not allow for maximum penetration, but that has not been my experience. 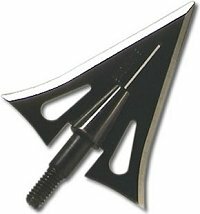 In fact, the concave design and huge cutting width (bigger than any other 2-blade head on the market, that I know of) are a big part of what makes this a great broadhead in my opinion. Also, the .050" main blade is the thickest one on the market and is decidely stout. You won't be worrying about the tip folding over or anything like that, I can assure you. I also found these heads to fly beautifully, with great accuracy. My experience with many "traditional" 2-blade cut-to-tip heads has been erratic flight and problems with planing, but not with the Sharks. I shot the 125 and 160 grain screw-in Land Sharks, and the 190 grain screw-in Tree Shark, and they all flew great. I haven't taken any animals with the 125 or 190 grain heads, but I have shot them a bunch into my broadhead target and they have the same great characteristics as the 160 grain head. To test the durability of these heads on something similiar to the shoulder blade of a deer, I shot them through a sheet of 1/4" plywood at a distance of 30 feet. They all passed completely through with no damage to any part of the head. I shot a 225 lb. 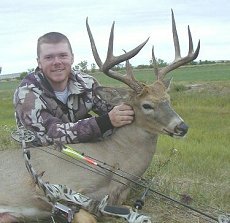 Montana whitetail buck in 2002 with the Simmons Land Shark 160 grain 2-blade. The shot was 25 yards, and the arrow zipped right through the heart and out the other side. He didn't know what had happened. He ran a few steps, then trotted about 40 yards, wobbled a few times and went right down. Because I saw him as he fell in an Alfalfa field I didn't need to bloodtrail him. However, for the purpose of the broadhead testing, I went and took a thorough look at the blood trail, and wasn't extremely impressed. I had sharpened the head till it was razor sharp, and the shot was from ground level and only about 4 inches above the bottom of the chest. I would have expected it to spill a lot of blood on the ground, but it didn't. There was a fair amount in the last 20 yards or so before he fell, but none at the point of impact or for 20-30 yards thereafter. I never was able to find the arrow, it must have gone quite a ways past the buck after the shot. A few months later I shot a 125 lb. 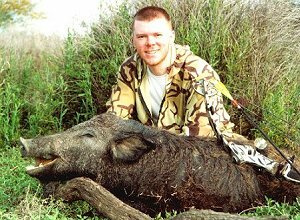 wild hog in south Texas with the Land Shark 160 gr. 2-blade. The shot was at 10 yards from the ground. I made a perfect lung shot, had a complete pass-through and the hog took off like a scalded cat. I wasn't able to find the arrow, again, but I did find a spot of smeared blood on a bush a few yards from the point of impact. Unfortunately, that was the only blood I found while looking for the next 2 hours. I was hunting in thick, tall brush and could not see the hog anymore after it had run only about 10 yards. If not for some vultures circling low over a certain thicket, I would not have found the hog. After I saw the vultures circling 2 hours after the shot, I went over to that thicket and crawled around like a snake and finally found the hog, dead as a stone. It had obviously died quickly after the shot, as it was already quite stiff. There was almost no blood on the ground around the hog or where it was laying. The lack of a good blood trail on my deer and no blood trail on my hog isn't something that I fault the Simmons broadhead for. As I mentioned above, I'm not real keen on 2-blade heads in general in a situation where you're really going to need a good blood trail. I think a razor sharp 2-blade head will kill just as quickly as a razor sharp 3-blade or 4-blade head, but it just won't leave as good of a blood trail, in most instances. If I'm hunting in open country where I can see a good ways, I wouldn't mind using a 2-blade head again, but if I'm hunting in thick stuff I'll be using a 3 or 4-blade head. If a 2-blade, cut-to-tip head is your cup of tea, though, I'd recommend the Simmons Shark over any other similiar style head on the market. One last thing, the Simmons Sharks do not come razor sharp out of the package, like many heads of this style, but they are easily sharpened. I use a ceramic crock stick and then strop them on a piece of leather and they're super sharp.